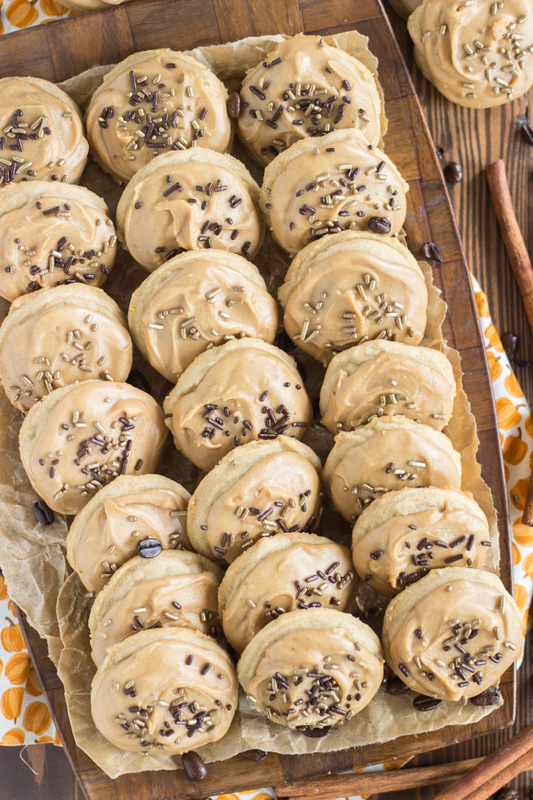 Soft, puffy, melt-in-your-mouth Amish Sugar Cookies, strongly spiced, potently flavored, and generously frosted with a PSL theme! 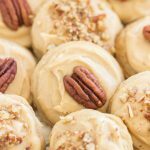 These Pumpkin Spice Latte Amish Sugar Cookies feature pumpkin spice and coffee both right in the cookie itself, and in the icing too! 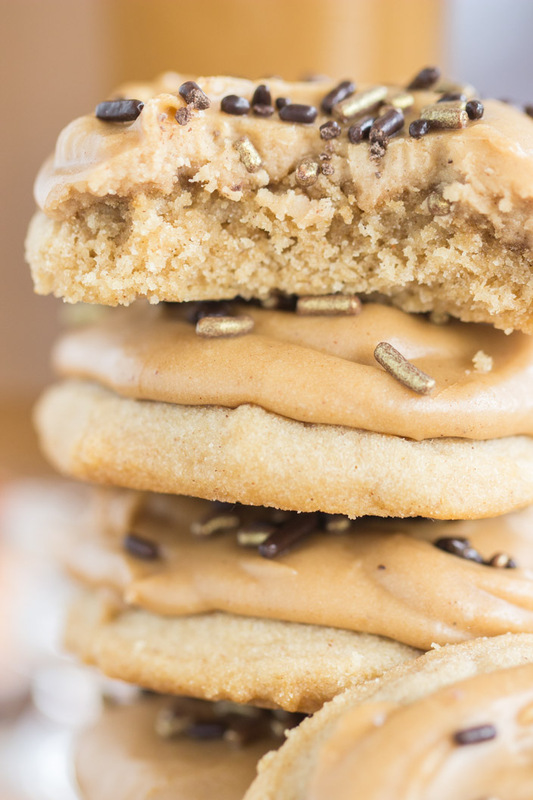 Welcome to a new variation on my favorite Amish Sugar Cookies. I *had to* make these with a PSL theme. I love these cookies too much, I love pumpkin spice things too much, and I love coffee too much. 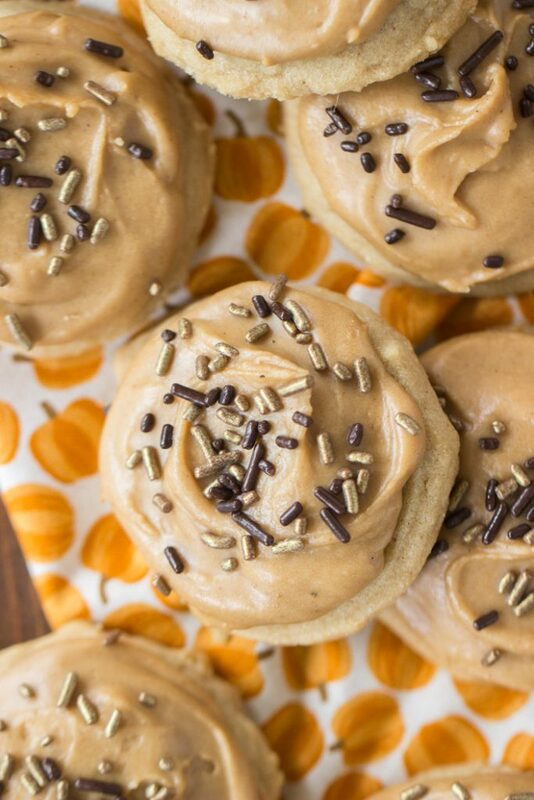 These Pumpkin Spice Latte Amish Sugar Cookies were a must-make this fall. As much as I love most PSL things, I don’t actually like the O.G. itself: Pumpkin Spice Lattes from Starbucks. There’s something ‘off’ about them. Everything else PSL, I’m into. What’s your take on a Starbucks PSL? I made these Pumpkin Spice Latte Amish Sugar Cookies with A LOT of pumpkin spice and A LOT of coffee. These cookies have both ingredients right in the cookie dough, but also in the icing. 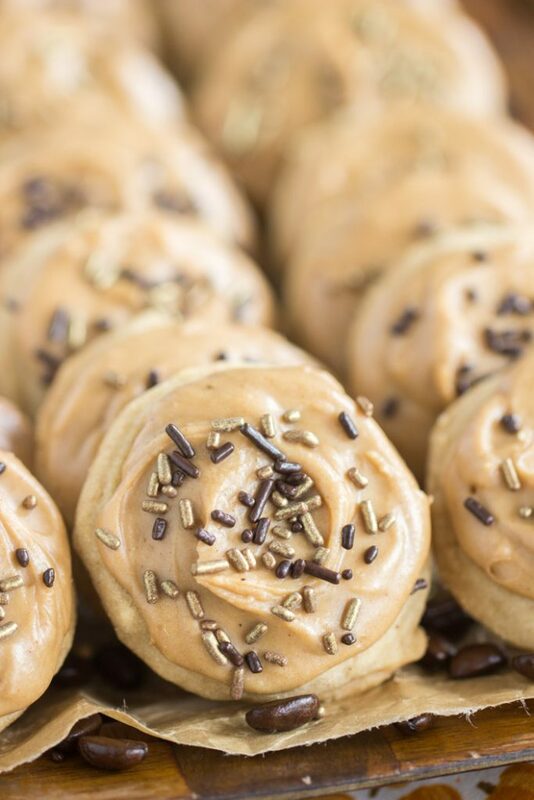 They’re PSL-ed from top-to-bottom, and they’re potent. I went pretty thick on the layer of icing… good stuff. Adding those flavors doesn’t change or take anything away from the incredible texture of these cookies though. If they have a top selling point (although there are many wonderful qualities of Amish Sugar Cookies), it’s their texture, hands down. 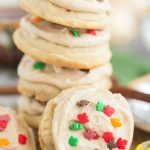 What do I (and many readers) love about regular Amish Sugar Cookies? They remind me a lot of a cut-out cookie, but they’re a drop cookie, so they’re a fraction of the work. No chilling, no rolling/cutting. Simple. They’re very soft and puffy, very pillowy, but their overall essence is a lot like a cut-out cookie. 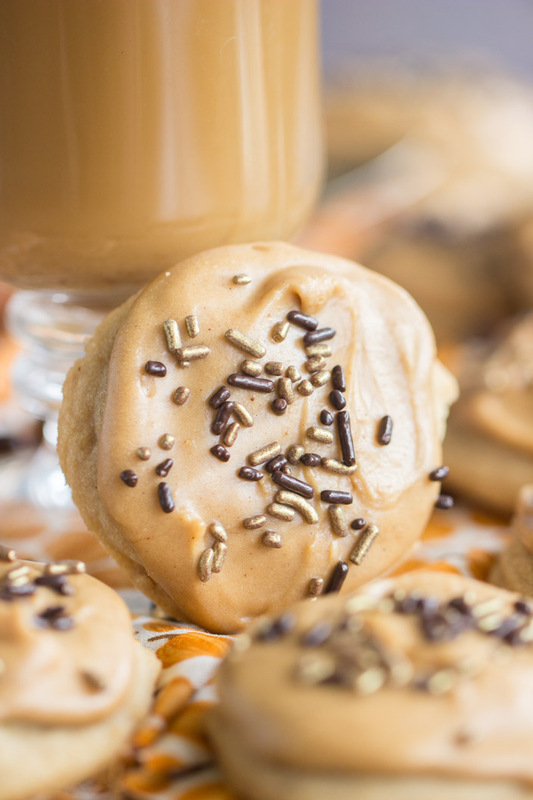 Also great – they’re super simple to whip up, and one batch makes a ton of cookies. You can easily feed a crowd. They’re ridiculously versatile too. Amish Sugar Cookies are terrific as-is, plain, with no frosting or fancy adornments. 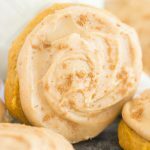 However, they can be doctored up super easily, which is why you’re seeing these Pumpkin Spice Latte Amish Sugar Cookies! 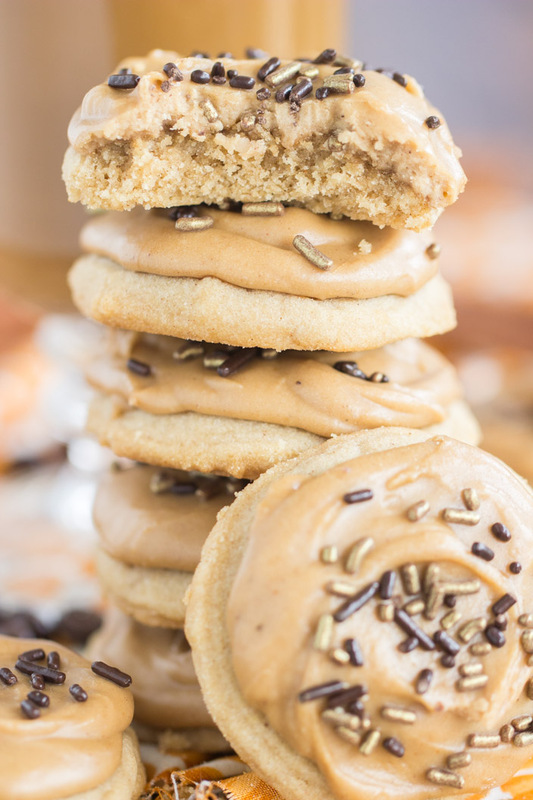 On another note, I have another PSL-themed cookie on the blog, these Pumpkin Spice Latte Cookies, and they actually have pumpkin in them too, versus just pumpkin spice. 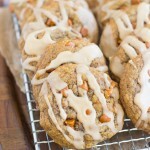 They’re a chewy pumpkin cookie, which is rare, and they’re fabulous. Oh, almost forgot these Pumpkin Spice Latte Rice Krispie Treats too. Nothing wrong with a cakey pumpkin cookie either, and these tried-and-true Pumpkin Cookies with Brown Butter Icing are my favorite soft pumpkin cookies. They’re kinda like mini pumpkin cakes, really soft and tender. 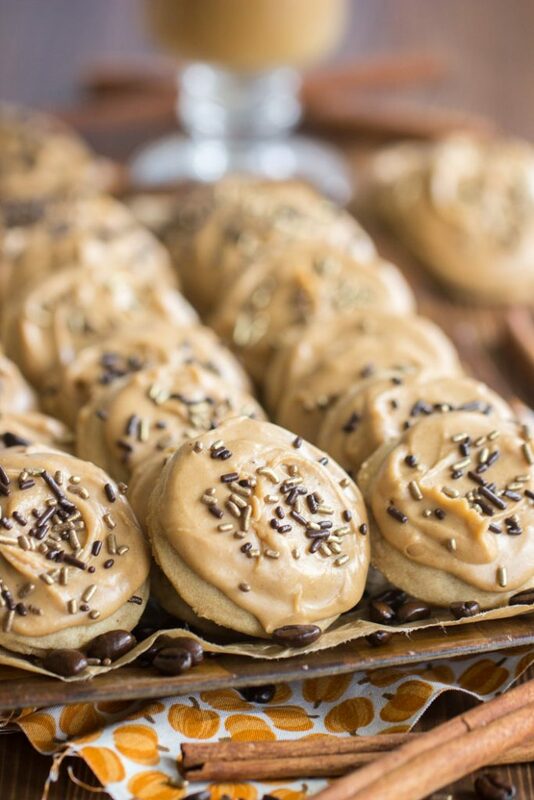 Soft, puffy, melt-in-your-mouth Amish Sugar Cookies, heavily spiced and heavily iced! Coffee flavor included! 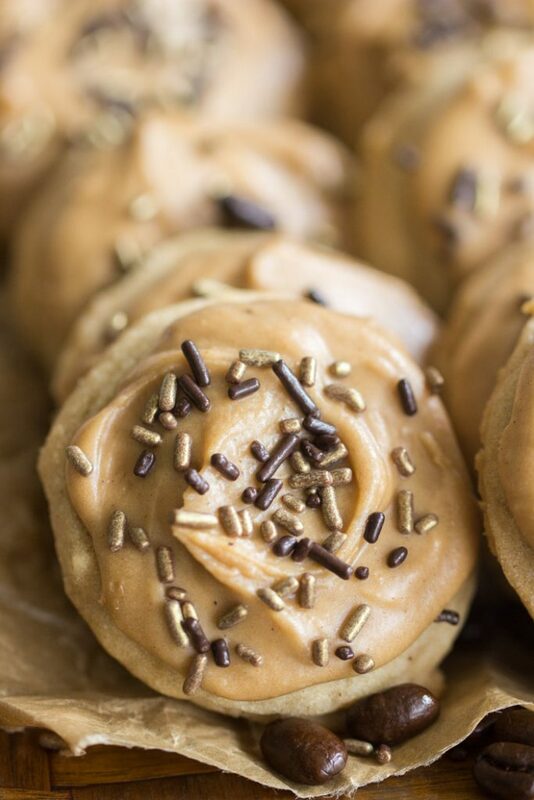 🙂 These Pumpkin Spice Latte Amish Sugar Cookies feature pumpkin spice and coffee both right in the cookie itself, and in the icing too! 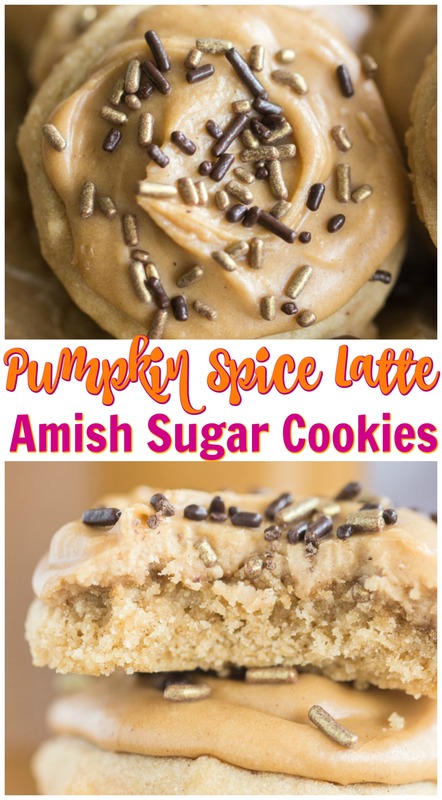 This Pumpkin Spice Latte Amish Sugar Cookies recipe is super easy and makes a big batch! In a small bowl, whisk together instant coffee granules and water. Add to mixing bowl, and beat until combined. In a large bowl, whisk together flour, baking soda, cream of tartar, and pumpkin pie spice. In a large bowl, whisk together 1/4 cup coffee and instant coffee granules. Add butter, vanilla, pumpkin pie spice, and 4 cups powdered sugar, whisking until smooth. 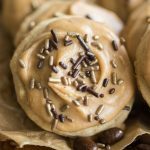 Add additional coffee or powdered sugar, as needed, to achieve a thick, but spreadable consistency. It should be thicker than a glaze, and it shouldn't run off the cookie, but should be easily spreadable. 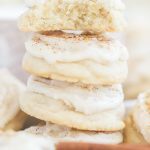 I've made these Amish Sugar Cookies into Iced Almond Cookies, Iced Lemon Amish Sugar Cookies, Iced Orange Amish Sugar Cookies, Toasted Coconut Amish Sugar Cookies, Coconut Oil Amish Sugar Cookies, and Thin Crispy Amish Sugar Cookies! These cookies look fantastic! Pinning!